The Claymore sword is usually identified with the Scots as a symbol of pride and strength. The Claymore sword , or "Claidheamh-mor" (Great Sword) in Gaelic is a two handed broad sword utilized by the Scottish Highlander throughout several centuries. The claymore sword was used in the constant clan warfare and border fights with the English from the 1400's to 1650 and still in use as late as the Rebellion of 1745, the two-handed Sword Claymore seems to be an offshoot of earlier broadswords as they were developed into great swords. The Claymore sword was feared because of its strength and size. It was said that the bearer of a Sword Claymore needed no shield because the reach of the sword provided its own protection. Today, the Sword Claymore stands as a great symbol of Scottish heritage. Jacob I (1394-1437). King of Scotland, was crowned in 1424 in Scone. Jacob I decreased the power of the feudal lords after overwhelming the Albany clan , because of the conspiracies against him when he was a child. Under his rule the scotish laws were codified and a system of weights and measures were set. Jacob I , a remarkable poet , was asassinated by Sir Robert Graham in a conspiracy. For his bravery in the battle and "strong hand" for ruling his country, Jacob I was called "the Lion of Scotland". Marto , a fine spanish sword manufacturer located in Toledo , Spain , presents the historically accurate display version of the Jacob I , "Lion of Scotland" claymore sword. Handle: 24 karat gold and silver plated hilt with wood grain handle adorned with silver and gold ornaments front and back. 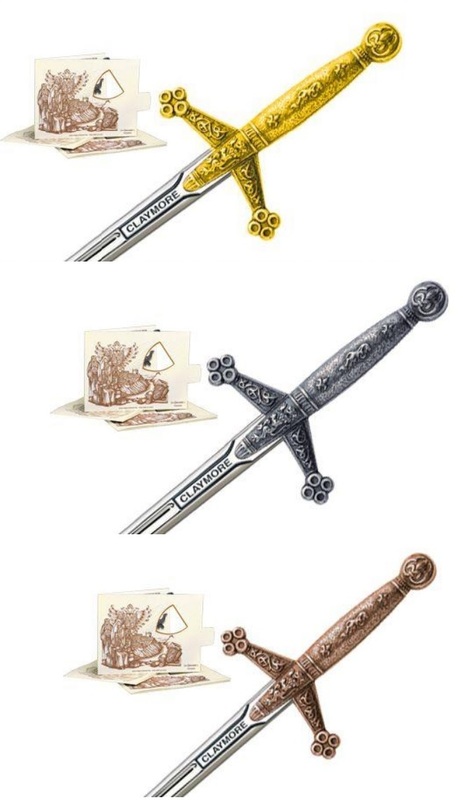 These beautiful Damascene Scotish Claymore Sword Letter Openers are manufactured in Toledo Spain by the famous Midas factory of the Marto swordsmiths. 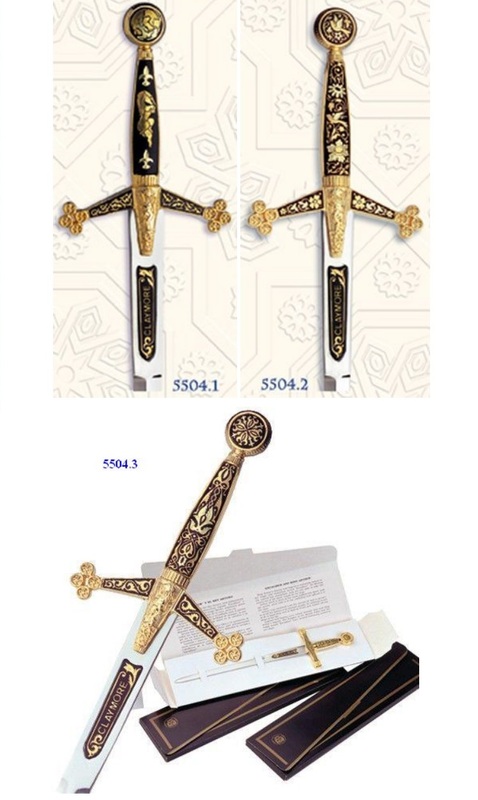 The Damascene Claymore Sword Letter Openers are plated with 24 Karat yellow gold and 18 Karat green gold with a minimum thickness of 4 microns. This is a high quality product made in Toledo Spain which you can proudly gift or display and utilize.